The Committee for Human Rights in the Philippines (CHRP) with US-based chapters in New York (NYCHRP), Portland (PCHRP), and San Francisco (SFCHRP) and the Washington D.C.-based Katarungan: Center for Peace, Justice and Human Rights in the Philippines will launch the Stop the Mining! Stop the Killings! Campaign 10 Days of Action on Saturday, December 1, 2012. The campaign, which culminates on December 10, International Human Rights Day, calls for justice for the Capion family, withdrawal of the Armed Forces of the Philippines (AFP) from all Lumad areas, Xstrata-SMI’s abandonment of the Tampakan Project, and cutting U.S. military aid to the Philippines. The Stop the Mining! Stop the Killings! Campaign condemns the October 18th slaying of Juvy Capion and her two sons by the 27th Infantry Battalion (IB) of the AFP. Daguil Capion, Juvy Capion’s husband, had been targeted by the military for leading the B’laan tribe against the entry of Xstrata-SMI’s Tampakan mining project. “Targeting and other tactics are part of a continuing pattern of intimidation and impunity used by the AFP to violently suppress the growing opposition to aggressive mining development in the ancestral lands of the indigenous peoples of Mindanao,” explained Hanalei Ramos, Director of Public Relations at NYCHRP. “This language merely reinforces the culture of impunity and gives an explicit green light to further military and police operations that contribute to the worsening human rights situation in the Philippines,” said Rupert Estanislao, Chairperson of SFCHRP. “During the 10 days of Action, we’re asking people who uphold human rights to condemn the AFP murders of Juvy, Jordan, and John Capion,” said Rossella de Leon, Secretary General of PCHRP. 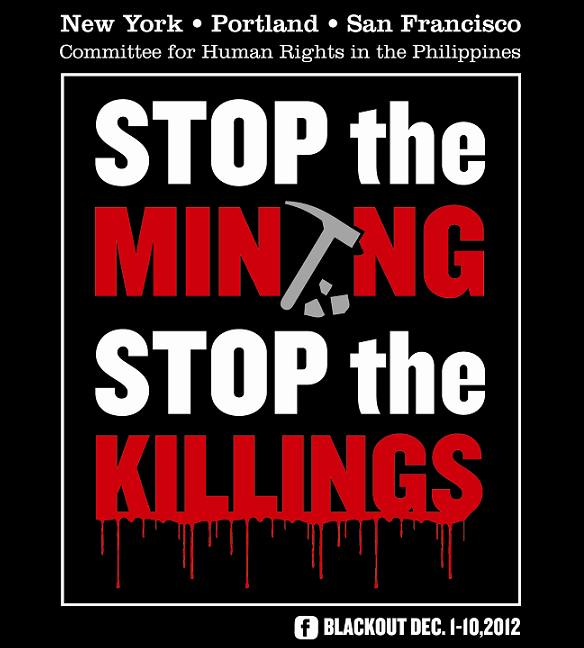 The public is urged to join the #StopTheMiningStopTheKilling social media campaign; sponsor delegates participating in Manilakbayan, a caravan and march that addresses the effects of large-scale mining on human rights; and to call Ambassador Cuisia at the Embassy of the Philippines in Washington, D.C. to demand justice for the Capion family. Previous Post Join us on 12/2 for Human Rights Workshop & 12/10 at Lights for Rights!